Chauncey is a French Bulldog who had an acute onset of back pain. He was diagnosed with IVDD and a hemilaminectomy was performed. His post-op recovery was slow and resulted in continued discomfort and hind limb nerve deficits despite surgery. After just two acupuncture sessions he appeared to be less anxious and more comfortable. By the fourth visit he was showing improvement in his nerve deficits and ambulation. Chauncey is a 3 year old male neutered French bulldog who became acutely reluctant to use stairs, stubbled when walking, whining, trembling and kyphotic. There was no history of trauma. Spinal x-rays at the neurological services revealed anomalous L7 vertebrae with transitional L/S. An MRI was performed and revealed severe disc extrusion at L7-8. A right hemilaminectomy of L7-L8 with annulectomy and discectomy was performed. He was weaned off prednisone, tramadol and methocarbamol. 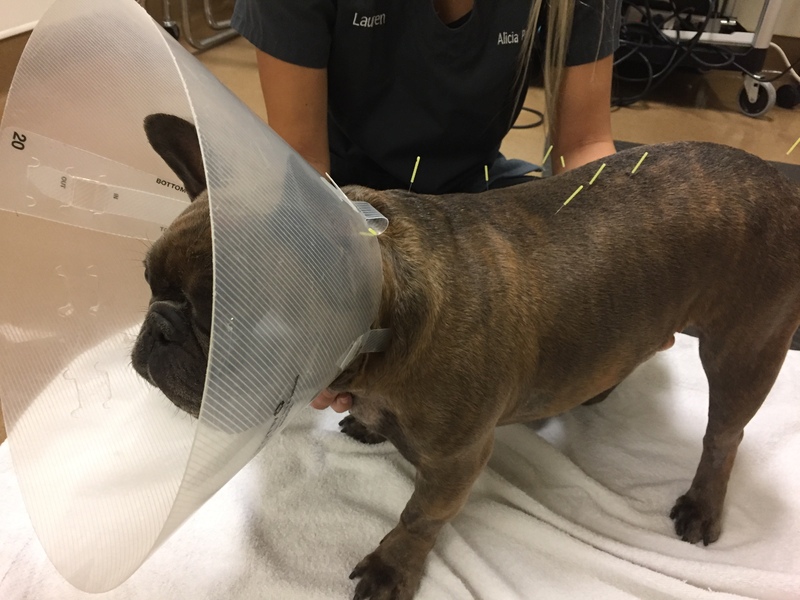 The owner brought Chauncey in for an acupuncture consult in hope to improve his ambulation and pain that has been constant since surgery. Pain medications and muscle relaxers make him sleepy and show little to no improvement in pain or gait. The owner reports he doesn’t want to play nor be pet like he use to. Chauncey is otherwise very healthy with no past medical history and currently not taking any medications. Ears, Eyes, Nose, Heart, Lungs, Abdomen all appeared normal. Integument: Shaved area with hair growing back and scar extending from mid to caudal dorsum. Musculoskelatal/neurologic: Anxious and aggressive. Alert, responsive, ambulatory with right pelvic limb paresis. CP absent in right pelvic limb, delayed CP left pelvic limb. Exaggerated panniculus reflex with paraspinal hyperesthesia and tenderness to palpation at the level of T10-12. Resists cervical rotation. No pain on ROM of hips bilaterally. Myofascial palpation exam: Generalized whole body stiffness, but subjectively taught right cervical bands and increased muscle tone with palpation of right cervical neck. Trigger points identified in trapezius and brachiocephalic muscles.Tenderness to palpation along T10-12. No pain or trigger points palpated in hind limbs. Recheck spinal x-rays recommended, but declined by owner. No diagnostics performed. The acupuncture approach focused on myofascial disturbances. The myofascial components that were identified and included in the acupuncture approach were the cervical trigger points at the trapezius and brachiocephalic muscle and trigger points along T10-12. The channels that were specifically investigated were the governor vessel, Huatuojiaji points, bladder points, stomach and gallbladder. Due to the patients temperament the sequence of treatments were short, but frequent in the beginning starting with 2 sessions in the first week. Post-op pain secondary to hemilaminectomy at L7-8 vs Intervertebral disc disease at T10-12 and cervical neck (new location) vs Spinal fracture or luxation vs Extra-axial hemorrhage. Intervertebral disc disease at T10-12 and cervical neck, but without diagnostics could not be confirmed. Post-op pain secondary to hemilaminectomy at L7-8 including nociceptive pain secondary to disuse and stress during the surgical recovery period based on the significant amount of myofacial pain and tension. Due to the patients aggressive behavior an e-collar was placed on the pet for protection of handlers and only points distal to the mid cervical neck were considered in the treatment plan. As electroacupuncture was not available at time of treatments dry needling was performed for all treatments. The acupuncture points that were selected for the first treatment included- GV 14 and Bai Hui for autonomic nervous system input. BL 10, BL 11 and caudal lateral cervical spinal points for central nervous system input. As well as spinal and cervical trigger points. The patient did not tolerate peripheral points. The second treatment was 4 days later and then treatments were spread out to once a week until significant myofacial improvement was noted. Subsequent treatments were all 20 minutes in duration and included the previous points in addition to the following: BL 18, BL 19, BL 20, BL 21 for local pain and tension. Peripheral nervous system input through BL 60. ST 36 was used for its anti-inflammatory effects. HT 3 for anxiety and stress. GB 31 and bafeng added on the third treatment for hindlimb neurologic disorder specifically for the right pelvic limb which continued to show absent conscious proprioception. Skin rolling and massage at home was recommended after the third treatment as the patient tolerated manipulation at this time. When available lower level laser therapy will be initiated.